AUSCA Sports, Built by Bacchus in Adelaide in 1959, one of Paul England's 16 FRP bodies which has a serious resemblance of the 1955 Maserati's A6GS. Powered by modified Holden grey motor, triple carburettors, 3 speed modified gearbox. CAMS Certificate of Description a truly historical master piece with Jack Brabham's signature under the bonnet along with other motor sport legends. Competively raced on many of the Australian tracks. The grey motor has been modified particularly with the head, larger valves, double valve springs, I do not know what has been done to the pistons and rods, but I know that changes have been made, as it loves revs, it just sings at 5,000. The crank shaft appears to be original. The sump has been modified using baffles to keep the oil back at the pump when severe braking and G forces on the race track. the cooling system has a total change using a header tank, you may get the drift from the pictures. Triple SUs, with a much non standard exhaust. Electronic ignition. The gear box remains much the same ad the usual grey, heavier clutch, larger main drive shaft and bearing and have modified, larger, the cir-clip at the end as it was giving problems popping off changing down at high revs. Running second third , third to second in a straight line is good for the race tracks I use. QUICK look at this Plain Jane-looking Humpy and the last thing you would expect is some high-tech wizardry under the bonnet. Okay, it's not exactly the latest and greatest in computer-controlled, multi-valve engineering, but back in the mid-50s it was about as hot as you could get. 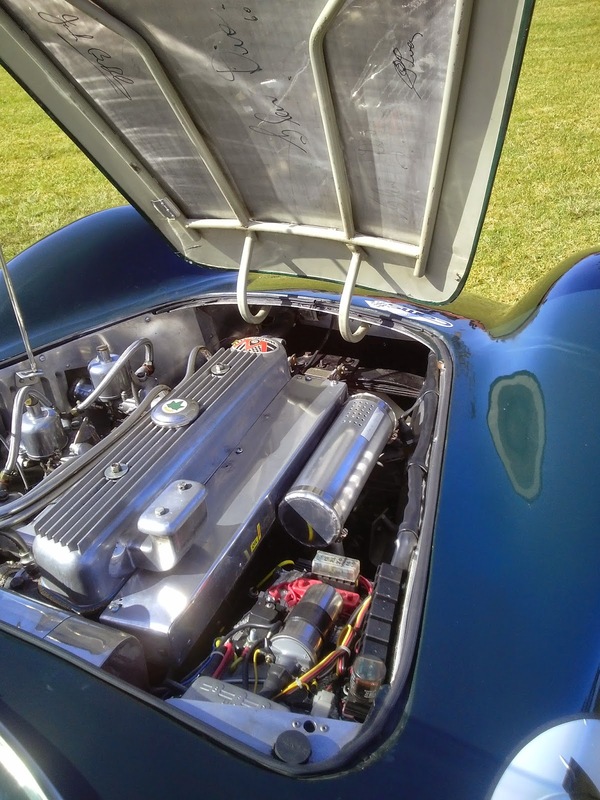 You see, sitting under the smooth black bonnet is one of only nine Waggott twin-cam heads ever built. George Starkey is a big fan of the early Holdens and when it came to building this latest one, he just had to have the rarest — and arguably the best — when it came to grey motor hot-up bits. With the most legendary of old-school power plants under the bonnet, George tried to keep the rest of the car as true to the era as possible. The only immediately visible variations from stock are the widened rims, lowered stance, gauges and indicators. But once George parks the car and pops the bonnet, it's like bees to honey, he reckons. And that's no surprise with a donk that most people — even die-hard early Holden fans — have never seen in the metal. "As far as we can tell it's the only Waggott head that's ever been on a registered car. All of the others were on race cars or boats; George says. No wonder most people have never seen one! So where the hell do you find the Holy Grail of grey motor hot bits? Well, George won't get too specific, just that he got it from a collector who'd had it for many years. “The things are practically priceless. Only nine were built and only eight ever left the factory. Peter Waggott (Mervs son) knows where seven of them are and blokes just don't sell them; says George, "so I was pretty lucky to get this one. Everything's for sale for the right price!" Although he finally had his hands on one of the super-rare pieces, it wasn't just a matter of bolting it on. George had the head, cams and top half of the front cover, but was missing the bottom piece. 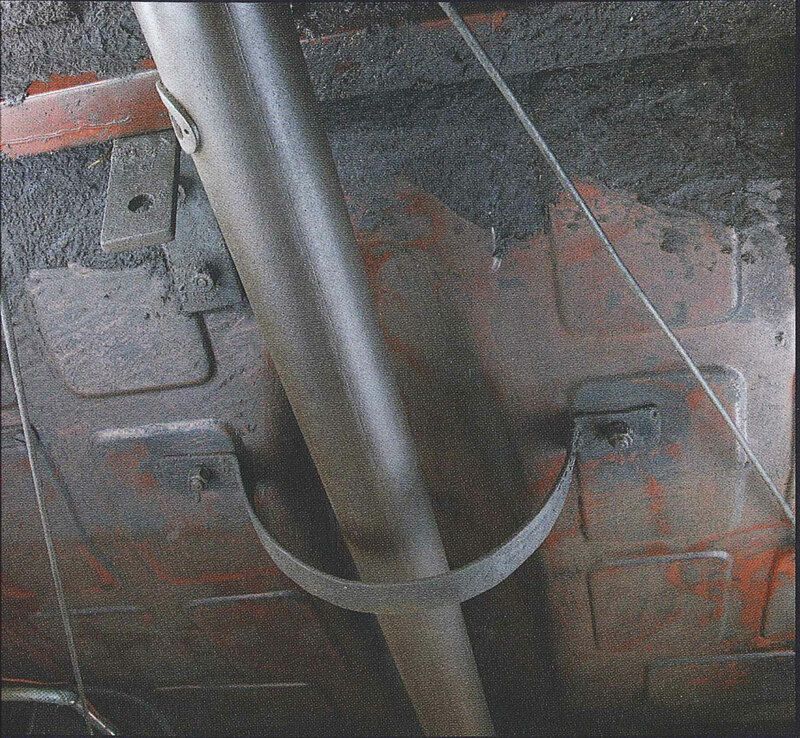 So he turned to Peter Waggott — who still runs Waggott Engineering at Alstonville in Northern NSW — for help with the missing cover "It was cracked and warped but we put it in an oven, straightened it out and welded it up," George says. That's the kind of commitment required if you want to run this hard-to-find gear. Waggott also supplied a seven-bearing conversion to keep the bottom-end together but George went one better by getting Stan Dare at H&B Sales to sort out a more bulletproof solution than even Mr Waggott managed. Even though it's only a four-bearing unit, a brand new billet stainless crank was machined with knife-edged counterweights and big-end journals the same size as a 327 Chev. holds a bit of extra oil for good measure. That wasn't the only hurdle George faced. As most of these heads were designed for hydroplanes, not much thought went into a cooling system suitable for everyday road use. Thanks to some very clever thinking and engineering by Peter Sugden at Olden Engineering, a neat set-up was created. Up front is a V8 Commodore radiator turned on its side and re-configured with new outlets and cap location by Eckersley Radiators. From there the water heads to a stock water pump, remote-mounted on custom brackets. It then flows to a distribution block that sends equal water pressure to the block via the old welch plugs which have been modified with o-ring seals and special fittings. The coolant then passes through the block and heads, out through the middle of the head and back to the radiator via some more copper pipe. With the engine really breathing, the old single-barrel Strommie was out of its league. George figured a trio of 40mm DCOE Webers would do the trick nicely — as did Merv back in the day. Out the other side of the head is a custom set of extractors. The 2.5-inch single system was put together by Van Flow Technology and has a slight turn-down at the rear so the game isn't given away by the big-bore pipe. the car stop and handle within the limits of 60s technology — no disc brakes or rack and pinion swaps for this car! The upshot is that the front subframe was boxed and welded for extra rigidity and the nose of the standard FX crossrnember extended to meet the subframe. ABS ventilated drums were fitted front and rear — HD front and EH rear — craftily modified to allow the fitment of the early Holden wheels. Out back is a stock FJ banjo diff with a 3.9 LSD, XU-1 axles and 32mm lowering blocks. Up front are re-set coil springs, with Koni adjustable shocks all 'round sorting out the bumps. Enough of this early high-tech goodness how does it go? it flies! The only place I've really been able to open it up is Eastern Creek. Coming onto the main straight we were doing about 90mph and must have got it up to about 145mph. It was off the tacho and that goes to eight-and-a-half grand!" says George. With flawless black paint by Terry Smith, near-stock interior and simple black steelies and caps doing a good job of hiding the modem 15-inch rubber, this is one old girl that might catch a few people unawares when the lights go green. ONE OF NINE CONSIDERING only nine of these suckers were built, it's amazing that any survived at all. The rarity is partly due to the they could only be had as a complete engine package. You couldn't just head down to your local speed shop and pick one up from the shelf, Nape, you rang up Mev and he put the whole shooting match together for you. ....- The package not only included the alloy, twin-cam, 12-port crossflow hemi head, but also a strengthened and dry-sumped Holden grey block. The cams were chain-driven and it could be set up with triple OCOE Webers (like George's) or for the serious racer, six Amal motorcycle carbs. So how hot were these engines? You gotta remember, this was back in the mid-50s and stock greys made around 60hp — so wringing out 186hp (with Webers) was pretty impressive. More than 200hp could be made with the motorcycle carts, The Screaming Eagle hydroplane was powered if by an alky-burning, 155ci Waggon that reputedly made 229hp at 7000rpm! 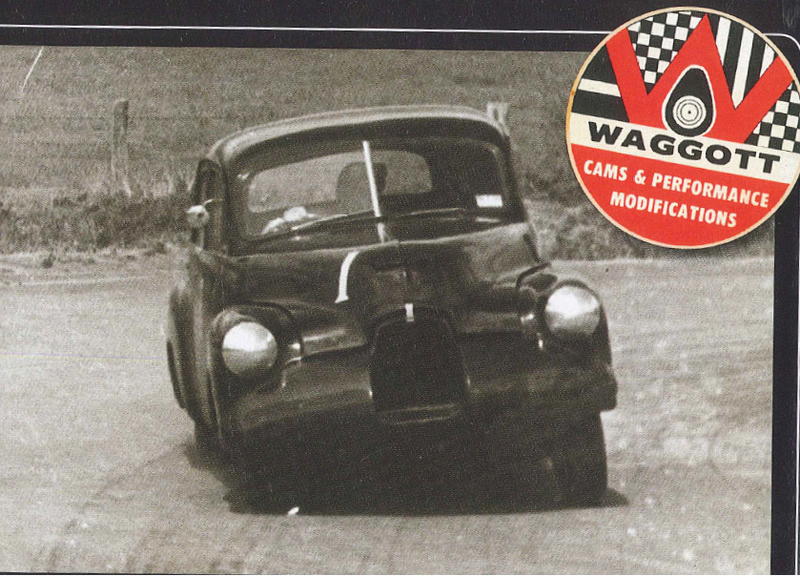 If you were really serious, Waggot could stretch your grey motor to a massive 190ci using a seven main bearing billet crank, with a cradle to adapt it to the block. Besides hydroplanes, VVaggott engines also saw use in speed cars and road racers. Bill Thompson's FJ was equipped with one and saw 138mph (220km/h) down Conrod at Bathurst in '58. ff you want to see a Waggott in action, your best chance will be to catch Bevan Batham's ex-John French Centaur/Waggott sports car in action. ONE of the top names in Australian drag racing must surely be that of 25-year-old engineering mechanic Max De Jersey, secretary/ treasurer of the Victorian Hot Rod Association and a leading light of the hot rod movement for the past four years. Max's interest in motor sport started at the tender age of 14 when he built his first machine an all-Independently suspended TQ which he had ideas of racing at the now-clefunet Brennoeic Park Speedway. Unfortunately Max's parents didn't share his opinion and the TQ was, in Max's words, "disposed of". 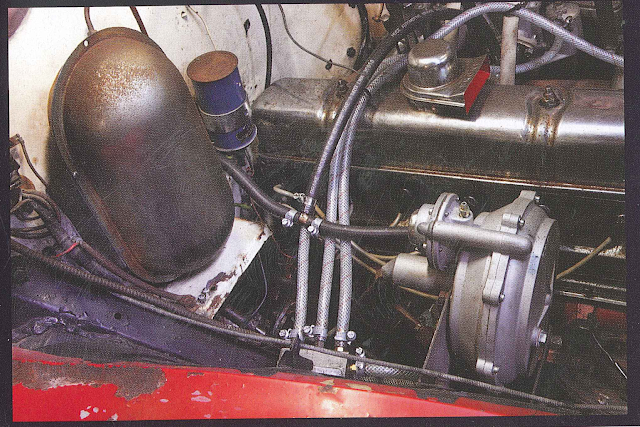 speed ENV gearbox, with tuning by Jack Wilson of Norm Beechey fame) power output was In the vincinity of 110 bhp. Unfortunately once again a little gentle pressure was applied and Max sold the car to track competitor Barry. Foster. He had a few punts but the oar's best performance was when Kevin Dean took it to third placing in the Victorian Touring Title at Phillip Island. In this race the car was beaten only by two Super 90 Porsches and did in fact lead home drivers like Norm Beechey and John Raeburn. Later In '58 L)e Jersey gained an interest in drag racing, which at that time was under the control of the Southern Hot Rod Club and very much In its infancy. This time there were no objections from his parents he had learnt his lesson and this time simply didn't bother to tell them. This new machine was a "Holden powered space frame" but during testing on a deserted country road, De Jersey came over a slight rise to find a cow filling most of the available space. During the hectic few moments which followed this monumental discovery the new device was untidily demolished. Max recalls with chagrin the fact that he even had to reimburse one irate cow cocky for destroying valuable livestock. Even worse were the number of stories doing the rounds. about De Jersey who shunted de Jersey. Shortly after this he married and for a time dropped all thoughts of competition motoring. However the bug was soon biting again and he invested in a '34 Ford sedan which as he describes was "my first big mistake". The Ford was good fun but even after chopping, channelling, and so on it was still far from a top performer. He ran at a few East Pakenham meetings but eventually sold the car to a speedway stocky who converted it for bash and crash. Again De Jersey bought out of things for a while, then in 1962 he built up an FX Holden strictly for dragging. Its first outing was on the straight at Phillip Island when the SHRC turned on a demo between events. His time was 16.2 on a slightly downgrade quarter and he duly col-lected fastest time of the day. This machine featured a 31 in. bore and at the Island ran with twin 2 in. SU carts. These were later replaced with triple 14 in. tarts and in this form Max clocked 14.85 seconds at the Victorian Sporting Car Club's Fishermans Bend quarter (and in Max's opinion a damn short quarter mile) sprint. This proved to be fifth fastest time recorded during the day for all classes and Max was pretty happy with the result. With sprints and drags few and far between this machine was sold. De Jersey once again went into retirement. Then in late 1962 Riverside Dragway finally got underway. At this time he was working with Dave Bennett at Perfeetune and it wasn't long before Perfectune built up another Holden strictly for drag racing. With Max at the wheel the Perfectune car clocked a best of 15.95, which wasn't too bad, although Dave Bennett later carried out further mods and lowered this figure to 15.7 seconds. Shortly after this Max left Perfectune, built up his own dragster chassis and installed an FX Holden power plant. Running only 1/8 in. over bore, single cart) and standard exhaust the new rail clocked 16.1 at its first outing. Max again set to and with chassis and engine modifications this figure came down to 13.2 seconds and 106 mph through the traps by November of 1963. With finance somewhat on the short side this rail was sold and for a time Max drove John Frencham's ex-police Studebaker Lark. This car was clocking times around 16.25 but due to Max's rather brutal power shifting it became necessary to replace the synchro after every meeting. The rail carried only one gallon of fuel, enough for two runs, and the cooling system consisted of ,host the water contained in the head and block —plus, of course, a pretty solid blast of air. The best ET ever clocked by Max was 12.1 and a terminal rate of 119.4 mph — not real bad for a standard bore Holden. Following his appearance at the February Riverside, where he once again took Top Elim honors with a time of 12.15 and 113.9 mph. Max announced that the rail had been sold and work was already well underway on a new beast. This latest rail is still in the process of development. How this new "jigger" will perform remains to be seen but one thing is for certain. Max De Jersey is in the game to stay — and his main aim in life is "... to introduce as many others as possible to this cheap form of the sport." Hot rodding is firmly on the map in Australia and, like America. it is here to stay. Melbourne and Riverside are in the enviable position of being the centres of the sport in this country. Big Question is. can they hold that lead? Latest developments suggest they can. They have the support of some of the State's best known motor-ing personalities. Three of them have new rails Projected and these promise to be big stirrers in the dragging world. Eddie Thomas has a new secret weapon which promises to be in the run-ning for Ton Eliminator. Knowing the way Eddie does things we don't hesitate to make that prediction. But there will be even more opposition. De Jersey's rail has already been mentioned but Mustang Man Nomi Beechey is on the way with one too. The chances are that a Beech Rail would be more than a little potent. He will undoubtedly pursue top rail honors with the same keenness as he has chased the National Touring Car title. And it just could be a Beechey year. After all, he just won the Australian Touring Car Cham-pionsh'ps and he has never looked better. Whichever way you look at it, the sport pro-mises to be rather exciting this year By the end of the year we predict the present movement will have doubled. tin other words. you can expect to see twice as many rods, rails and dragsters around. This can't fail to attract the spectators. Vive la Riverside! Back in 1959, the first set of National Competition Rules for Towing Cars (Appendix J} was drafted and approved by CAMS, to apply from January 1, 1960. A young bloke tom the bush called Des West, who was as skilled at spannering Holdens as he was at driving them, took a standard Holden 48-215 and turned it into a competitive race car that complied with the new rules. 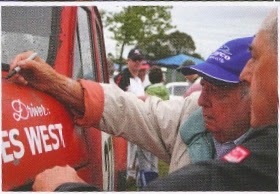 West and his father Lindsay ran the local Holden dealership at VI/Ingham, near Taree on the NSW mid-north coast. A qualified mechanic. young Des had been up to his elbows in Holden for more than a decade and knew them like the back of his grease-stained hands. 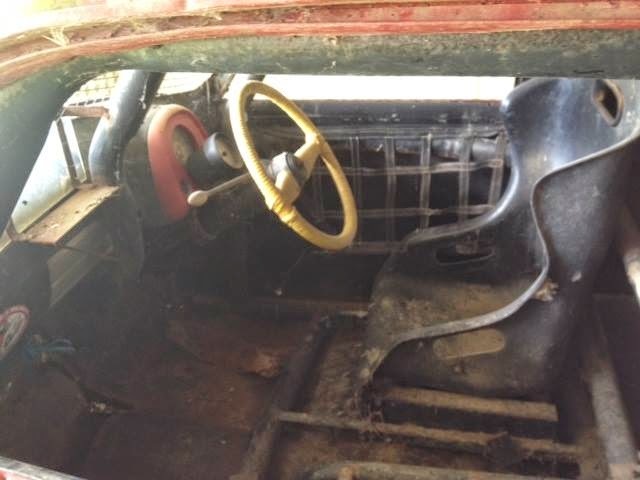 It didn't cost him a lot of loot to build this car and the finished product positively bristled with homemade, hand-fettled performance tweaks gleaned from years of mucking around with cars from an early age. It was quintessentially Austra ian, this early touriig car racing. No factory teams, mega-dollar budgets or flashy workshops. It was all about doing a lot with not a lot; choosing the best car you could afford and drawing on your set of skills to get the best out of it. Finding out what made it tick, learning through trial-and-error how to make it go faster. And, no doubt, through more trial-and-error, how to drive it faster, too! Today, this immortal 48-215 is, as far as we know, the only original and un-restored survivor from that first ATCC race at Gnoo Blas, NSW in 1960. Its original owner/builder/driver, Des West, after spending many hours inspecting it in fine detail, has personally verified its authenticity. The fact that it still exists in suci unmolested, original condition, wit most of West's authentic circa-1960 'hot-rodding' tricks still kited, is something of a blessing for those of us with a tine appreciation of Vie past. 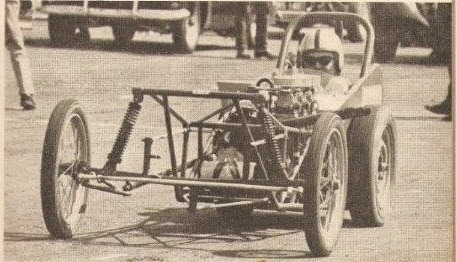 This is the way we went touring car racing when the Australian Touring Car Championship was born. Join us on a sobering journey to discover just how much the sport of touring car racing - and the cars we drove in it - have changed in 50 years. The first production version of Holden's 48-215 rolled off the GM-FI production line at Melbourne's Fisherman's Bend plant on November 29, 1948. heralding the birth of a teal' car manufacturing industry in Australia, making Australian cars for Australian people. The 48-215 was a four-door sedan featuring 'unibody' construction (body/ chassis built as one unit) and built on a 103•inch (2616mm) wheelbase. At 4.4 metres in overall length, just over 1.7 metres in width and standing just under 1.6 metres tall, its compact dimensions added up to a kerb weight of just over a ton (1011 kgs). More than two years after the 48.215 sedan was launched, a 215 utility model was also made available for the man on the land. Powered ay a 132.5cid (2171cc), overhead valve, six cylinder engine, with 6.5:1 compression and rated at 60bhp (45kWi at 3800rpm, the only transmission available was a three-speed manual with column shift. Brakes were four-wheel drums and the suspension was a simple and rugged coil spring/ upper & lower control arm arrangement with lever-type shocks at the front, with a leaf-sprung live rear axle under the tail comprising a banjo-type hypoid differential. With good fuel economy and a decent-sized fuel tank of just under 10 gallons (43 litres) in capacity. Australia's first car could cover 400kms between fills, with performance considerably better than many of the stodgy British offerings available at the time. And, for the price. it was a bargain. Not surprisingly, the Holden was an instant hit with the Aussie public and buyers eagerly joined long waiting lists at GM-H dealers around the country. Production lines at both Fisherman's Bend (Victoria) and Woodville (South Australia) were soon running at full capacity to try and meet this demand. Holden's 48-215 production continued until October 1953, when it was replaced by its face-lifted successor - the FJ. In that time, GM-H produced more than 120,000 48-215s in a combination of sedan and utility styles. If you weren't around in the 1950s, you could be excused for thinking that Australia's long-standing love affair with touring car racing has existed since 'Australia's Own Car' became a reality. However, back then touring car racing was in fact very much the second tier of the sport; a poor cousin to the 'purist' open-wheeler and sports car set that headlined major race meetings. Competing in cars with doors and roofs was looked down upon by the racing elite; it was something that people with oily rags in their back pockets and grease under their fingernails drove because they couldn't afford a 'real' racing car. Perhaps because of that, touring car racing's popularity - amongst competitors at least -enjoyed healthy growth in the '50s, helped along by the undeniable fact that it wasn't too hard or expensive to squeeze some decent speed out of Holden's readily available 48-Series Holdens (48-215 anc: FJ) and later the FE model released in 1956. They were also in plentiful supply (both the cars and their spare parts), cheap to buy and maintain and they responded well to modifications. In fact, it wasn't long before a thriving aftermarket industry was established, supplying a myriad of locally-developed performance parts (including complete cylinder heads, like Repco's popular 'Hi Power' unit developed by Phil Irving) and tuning tips to get the best out of them. There were also disc brake conversions, body streamlining, big pistons and valves, wild camshaft grinds and specially-made racing wheels. Extreme measures to reduce weight were also employed, including stripped-out interiors, removal of bumper bars even production of lightweight aluminium panels. 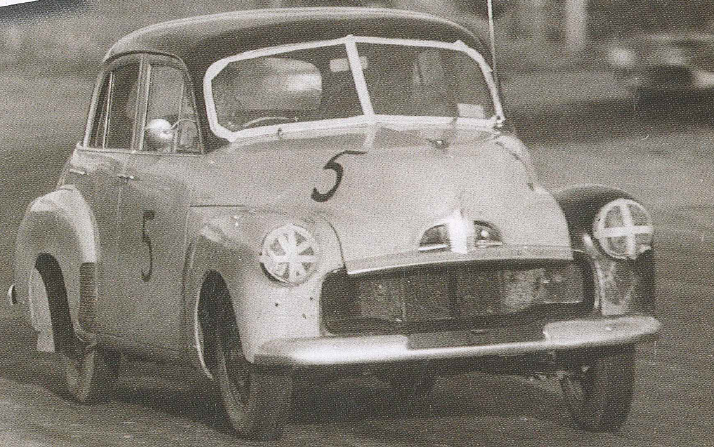 At a time when the annual Redex Round Australia Trials were still commanding most of the headlines for sedan car competition, the level of competition amongst the 1950's circuit-racing crowd was becoming very serious indeed. And a growing problem for the sport's administrators. Up untel 1960, there was no national set of rules for touring car racing; different circuit promoters had different regulations, which only encouraged increasingly uncontrolled levels of modification. Towards the end of the decade, things were clearly getting out of hand. By then, one 48-series Holden racer featured an engine bay stuffed full of a Waggott twin-cam cylinder head conversion; there was also an Austin Lancer with a full MGA twin-cam donk shoehorned into it; Peugeots, Morrises and Austins were even running full-blown superchargers. The 48-Series Holden 'guns' of the era were John French and Leo Geoghegan, driving cars so heavily modified that their links to the showroom products they outwardly represented were becoming increasingly thin. For example, French's ferocious two-tone green FJ featured a very trick Repco cylinder head designed for triple Weber carbs, a Jaguar four-speed gearbox with floor shift and was rumoured to be runring high octane alcohol fuel -one of the few things that was illegal. At one stage, French even took a large slice out of the FJ's bonnet - from the top of the grille right back to the windscreen - and welded in a section of flat steel sheet to create a large sloping `wedge' to reduce aero drag! And Geoghegan's now legendary black 48-215 featured a unique aluminium Repco cylinder head on a wickedly hot 'grey' motor claimed to be punching out 167bhp (125kW) - or almost three times that of the standard engine. Don't let the tame two-lone green paint and bicycle tyres fool you - John French's highly modified FJ was stove-hot! There was also a four-speed gearbox - from an MG - and even some thoughtful aerodynamic aids, including wind deflectors mounted either side of the grille to improve air penetration and a smoother under-body to tidy and speed up airflow under the car. Considering that Lotus czar Colin Chapman didn't start playing around with the science of ground effects under his Fl cars until the mid 1970s, this was cutting-edge stuff! Clearly, though, 'tin top' racing had become a world of outlaws. With no national set of rules to keep these blokes in line, the cars were now reaching alarming levels of modification and performance. Drivers were becoming increasingly concerned about where this was all heading. Not before time, change was on the way. Up until the early '50s, motor sport in Australia was run by the Australian Automobile Association (ANN), appointed by the Royal Automobile Club of Great Britain. This quaint but increasingly dysfunctional arrangement lasted until 1953, when motor sport's international controlling body, the Federation Internationale de L'Automobile (FIA), officially recognized the newly created Confederation of Audtralian Motor Sport (CAMS) as the local governing body. Fortunately, by the end of the decade, CAMS acknowledged a pressing need for a uniform and sensible set of national rules for touring car racing, if the category was to build on its burgeoning popularity with both competitors and spectators. So, as a new decade dawned, CAMS made two major announcements that would prove pivotal. Firstly, a new set of National Competition Rules for Touring Cars would apply from the start of the 1960 season. And secondly, in recognition that touring car racing was becoming a major force in the sport, 1960 would also host the first Australian Touring Car Championship (ATCC), that would be held annually and contested over a single race of at least 50 miles (80 kms). 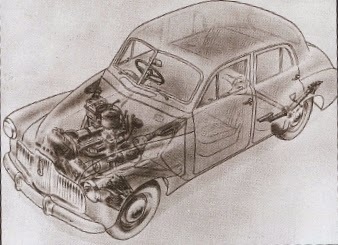 Put simply, the highly-modified 'sports sedans' of the 1950s, with their non-standard cylinder heads and gearboxes, huge brakes, stripped interiors, lightweight panels etc could compete in a new hybrid Grand Touring class called 'Appendix K' where they would share the road with closed sports cars. And a new class called 'Appendix J' would cater for a new breed of standardized touring cars, permitted very limited modification that would adhere much more closely to their showroom origins. Bodywork and interior trim had to remain standard, which was a good start. Above: A Holden-only race at Katoomba's fabulous Catalina Park circuit shows how popular and competitive the early model 48 Series Holdens remains, well into the 60's. The new rules allowed freedoms in some areas of tuning and race preparation and restrictions in others. On reflection, in some ways it was like an early version of the 1973-1984 Group C rules. Engine capacity could be increased within the class limitation that applied to a particular type of car. That was 2001-2600cc in the case of the ubiquitous `grey'- engined Holdens, which naturally prompted the boring of cylinders right out to the maximum displacement allowed. Cylinder heads had to remain stock, but valves, manifolds, camshaft and compression were free. Engine metal could not be cut, except for mild porting and polishing. Gear ratios had to remain as standard. 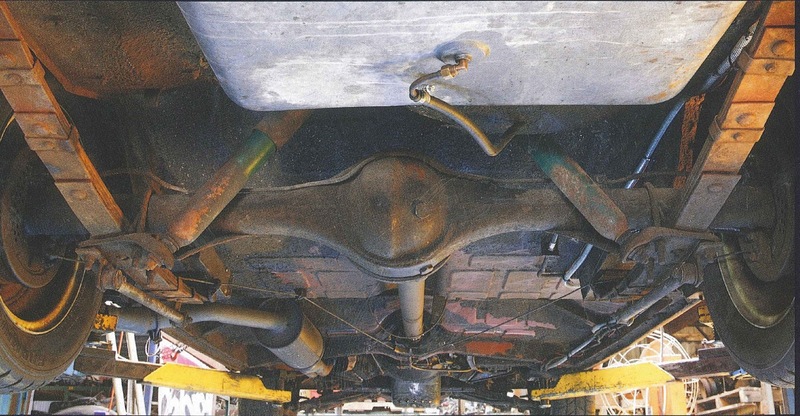 Suspensions also had to remain stock, but could be lowered and improved for racing with 'bolt on' items like uprated springs and shocks, anti-sway bars, radius rods, tramp rods, Panhard rods and the like. Wheel rims could be strengthened and widened to a maximum 1.0-inch (25mm) from standard. Brakes had to remain standard in both size and operation, but linings were free and additional cooling was allowed. For its time, Appendix J was a simple, sensible and cost-effective set of rules - standard road cars with a few little 'hot-ups' here and there. It was designed to encourage more drivers to compete and also appeal more to spectators, by showcasing the same cars they could go out and buy from their local dealer. Importantly, only Appendix J cars could compete for the newly announced ATCC title, so there was plenty of incentive for drivers to have a crack at this new more regulated form of touring car racing. Which they did, in ever increasing numbers, with many choosing to continue running the well-developed 48-215 and FJ Holdens, but also the odd later model FE series cars, too. 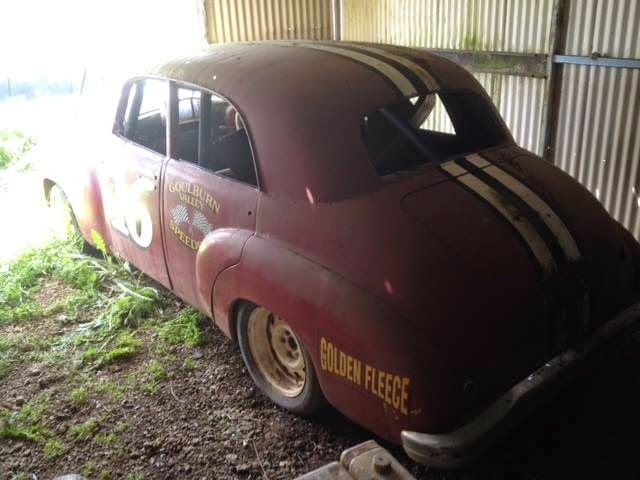 Not surprisingly, the aftermarket industry for Holden 'go-faster' bits that had sprung up in the 1950s continued to flourish into the new decade, with a staggering amount of expertise available for the Humpy Holden racer that wanted it. Lindsay and Des West after their outstanding Top 20 result in the 1953 Redex Round Australia Trial. For most Aussie muscle car fans, Des West needs no introduction. During the late '60s and early '70s, he was one of the top 'guns for hire' during Mount Panorama's muscle car war It was West who set a cracking pace in a privately-entered Monaro GTS 327 to lead many laps of the '68 Bathurst 500, against a swarm of Holden and Ford works cars, only to lose his second place result due to a post-race scrutineering dispute (for which he was eventually cleared of any wrongdoing). The following year, he was a star recruit for the newly formed Holden Dealer Team under Harry Firth, sharing one of three factory-backed Monaro GTS 350s with a fast rookie called Peter Brock to finish third outright. Dusty and rusty today, but 50 years ago a tweaked 48-215 was the gun machine for Holden racers to have in the new Appendix J era. He was also a works driver for Chrysler in 1970, winning his class at Bathurst in the factory's 4BBL Valiant Pacer. In later years, he also drove the legendary Falcon GT-HO Phase III and Charger R/T E49 at the Mountain. West's prominence in Bathurst history is well deserved. 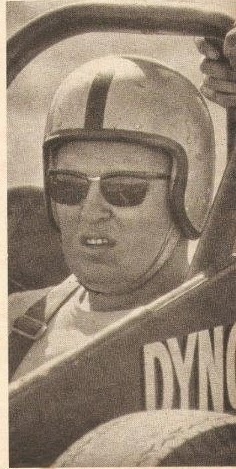 However, his path to national recognition had started many years before, when he partnered his father Lindsay in the inaugural Redex Round Australia Trial in 1953. Driving a self-prepared FJ Holden, the Wests completed all stages and finished an outstanding 19th outright on debut, with young Des doing most of the driving. The experience wet his appetite for competition. He continued to compete in the Round Australia Trials and numerous club events. 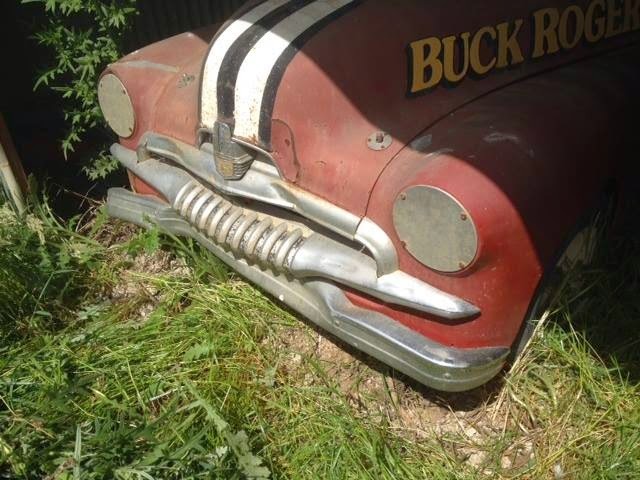 Its a 1953 model 48-215. West wanted a 48-215 as the basis of his race car, mainly because it was 50 lbs (23 kgs) lighter than the FJ model. However, he specifically wanted one of the 'late production' versions produced during GM-H's transition from 48-215 to FJ production in 1953, which were fitted with the first of the FJ's improved components like the latest telescopic shocks (as opposed to the 48-215 lever-type), wider rear leaf springs, stronger front cross-member etc. Des specifically tracked down this car for the purpose. West's Garage had sold it to an elderly local couple a few years before, who literally only drove it to church on Sundays. Des tracked them down through the Garage's sales records and did a deal to secure the car. You may have noticed by looking at the engine bay and inside the door jams that this old Humpy was originally a rather bland light blue/grey in colour. West's hand-built Holden engines were noted for their great power and sky-high rev tolerance. 7000rpm from a triple-carbed grey in 1960 was remarkable. Forged lumpy-top pistons gave 13.5:1 compression. When he started racing it, Des painted the roof section black to try to make the car stand out more on the track, which was how the car looked when it ran at Gnoo Blas in February 1960. However, no doubt inspired by those wonderful cars. from Italy with the prancing horse badge that did a lot of winning, he reckoned red racing ears just had to be faster, so later in the year he painted his car red, too. 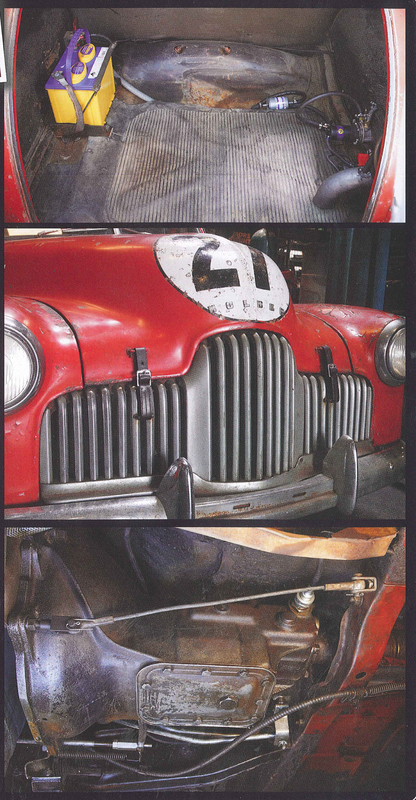 “When it came to winding out an engine, Des left 'Big Rev Key' for dead," claims former RCN editor and 48-series Holden racer Max Stahl. "On at least two occasions, Des out-dragged me when I pulled top at six-two (6200rpm), while he went on to well over 7000! I couldn't afford the crankshafts." After building so many hot Holden engines in the '50s that he kist count, by the time of the first ATCC in 1960, Des West had become a self-taught master in putting together some very strong and powerful Holden grey motors for racing. When this car's current owner Allan Garfoot carefully removed and stripped down its engine for a thorough inspection, he discovered a multitude of modifications that made this engine amongst the strongest of its era. Starting from the top, the standard cast iron grey motor cylinder head (as required by the Appendix J rules) was fully ported and polished and fitted with bigger valves, dual valve springs, lightweight aluminium retainers and pushrods. It was mated to the standard grey cylinder block using a special Repco composite head gasket, made from a copper/asbestos/copper sandwich with copper firing rings to withstand the sky-high compression ratio. Three GP Amal 1 3/8-inch, single-barrel, side-draught motorcycle carbs delivered a solid strea of fuel/air mixture to the inlet ports through homemade inlet manifolds, which were basically long straight lengths of metal tube (for increased torque) that delivered a nice clean shot straight into the cylinder head. The exhaust manifold was also a custom-made item; 1 3A-inch diameter pipe created a simple three-into-two-into-one arrangement, with a large single muffler and exhaust pipe exiting under the kerb-side passenger door. The engine's bottom-end featured stronger billet steel caps on the centre main bearings, for greater crankshaft strength and stability at high revs. The cylinders were over-bored to boost displacement to just under the 2600cc class limit and filled with Repco forged 'lumpy top' pistons pumping 13.5:1 compression ratio on 110-115 octane Avgas. The standard con-rods were balanced by 'tinning' each rod and then slowly filling them with solder between the webs. This allowed the weight of each rod to be adjusted to make a finely balanced set. The standard sump was fitted with a handmade windage tray to stop the crankshaft from frothing the oil and some baffles to reduce oil surge during hard cornering. Oil temperatures in racing were always a worry, so the capacity of the standard sump was increased to a whopping 8.0 litres by slicing off the base of the oil pan and extending it downwards, so that it ended up hanging in the breeze much closer to the road. 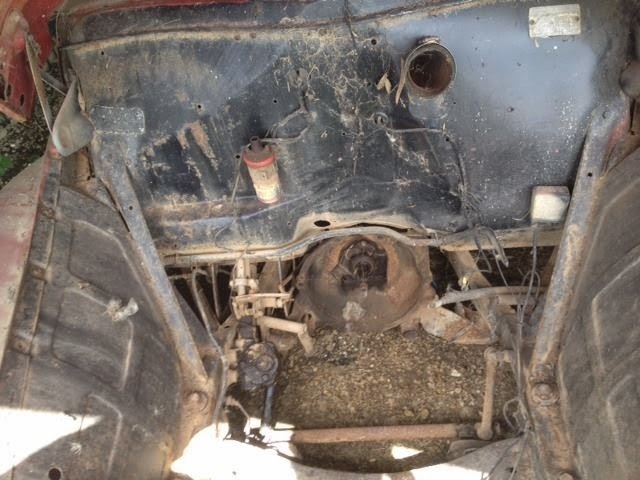 West took advantage of this by welding a line of small steel tubes into the base of the sump. These were open at either end, to allow air to pass through and cool the oil (above). And there were other oil management tweaks. 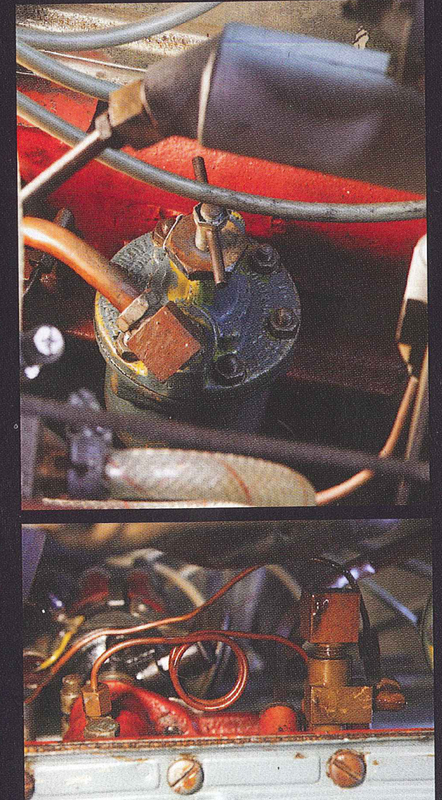 For example, the engine did not have an oil filter fitted as standard (!) but Holden at least made provision for an accessory oil filter if required. 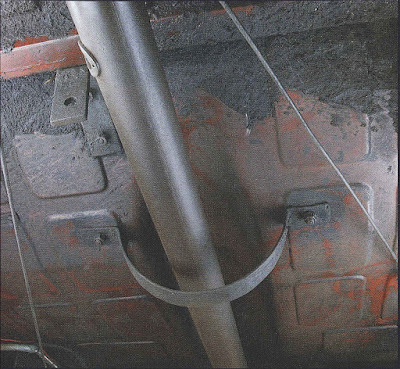 The unit West tapped into the side of the block featured a tap handle on top, attached to an internal vane which when turned a couple of times scraped any collected sediment through a fine grate into a cup below, that could be easily removed for cleaning (left). 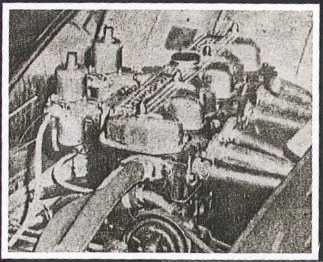 West installed an additional line to direct an extra dose of oil from the same gallery to the camshaft's distributor drive, which at high revs tended to run a bit lean of lube and was prone to failure (below left). On the back of the crankshaft, the standard flywheel was heavily machined and drilled to reduce internal masses for improved throttle response. Before the days of drilled bolt heads and lock-wiring, simple locking plates for the flywheel bolts were made from strips of sheet steel, with tabs bent over the heads to prevent them working loose. At the front of the crank, a Jaguar harmonic balancer - which was larger and heavier than the standard item — helped to tame a serious crankshaft vibration that occurred at a certain point high up in the rev range. West removed the engine's cooling fan to reduce air drag and therefore power losses. The radiator was also later modified. The standard 48-215 outer frame and header tank were retained, but the core was a special high-density unit commonly used on farm tractors, which often have to pull heavy loads at low speeds with minimal air flow. The tractor core's series of rectangular cooling tubes were positioned at a slight angle to the airflow, allowing a larger number of tubes per square inch and therefore greater coolant capacity and total (cooled) surface area. The 48-215's standard windscreen wipers were operated by vacuum pressure from the engine's intake manifold. They worked great under hard acceleration, but were pretty ordinary at other times! To combat this problem for racing, West mounted a large vacuum tank on the driver's side firewall (where the original 6V battery once lived) with enough capacity to maintain reasonable wiper speeds at all times (bottom left). This tank was fed by a hose from the inlet manifold, that split at a T-piece to supply vacuum pressure for both the wiper tank and the brake booster diaphragm. 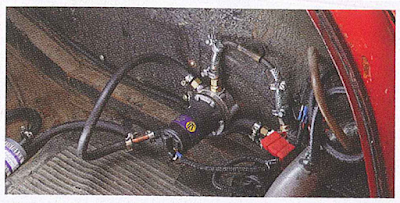 To maintain good fuel pressure, West couldn't rely on Holden's standard camshaft-driven mechanical fuel pump. 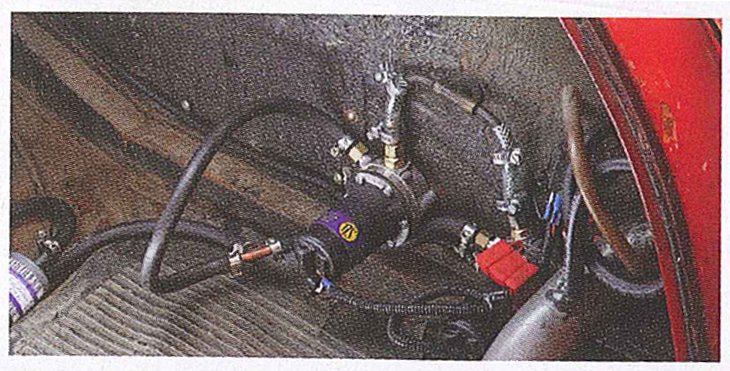 He instead installed twin SU electric fuel pumps in the boot (one sucking, one pumping) right next to the fuel tank. This fuel set-up, plus the sky-high 13.5:1 compression ratio, demanded plenty of electrical grunt and cranking power. So West upgraded the standard 6-volt system to a 12-volt arrangement, with the twice-as-large 12v battery relocated to the boot for better weight distribution (less weight on the front axle). Another simple change was made to the grille, with the centre 'tombstone' section modified so that it could be quickly removed for camshaft changes without having to hoist the engine out of the car each time. To do this, all the original grille rivets were drilled out and removed, leaving the centre section held in place by just four self-tapping screws. Small metal hoops were also attached either side of the grille and bonnet, through which short leather belt straps with buckles were threaded and tightened. That was because the rules demanded that, in addition to the standard bonnet catch, a secondary form of securing device had to be fitted to ensure the bonnet could not fly open at speed. Leather straps like these proved a low-cost and popular solution. There was also a restraining cable strung tightly between the bell-housing and the gearbox cross-member, to stop the engine and drivetrain shifting forward under hard deceleration and potentially nosing into the radiator core. Between the lightened flywheel and standard three-on-the-tree manual transmission was a heavy-duty clutch assembly with stronger pressure plate springs and a meatier driven plate to cope with the extra power and general abuse. Any casting 'dags' on the inside of the cast-iron gearbox casing were ground off and polished smooth, to improve oil flow in and around the gears and shafts. Larger and thicker bearing races and circlips were also fitted to provide extra strength and durability, along with a larger breather. The tailshaft was fully balanced. West also knocked up a simple tail-shaft loop made, from steel strap, which was bolted to the underside of the floor behind the shaft's front universal joint. This was designed to catch the shaft in the event, of a front uni joint breaking at speed, to stop it dropping down v. and harpooning into the road with potentially disastrous results. These loops are standard fitment in all RWD competition sedans. Diff Basically stock inside, as demanded by the Appendix J rules, which did not permit welding of planetary gears etc to create a pair of 'locked' rear axles for better traction. However, West did at least fit substantially thicker shims to the axle shafts to try to tighten things up and legally reduce the differential effect. 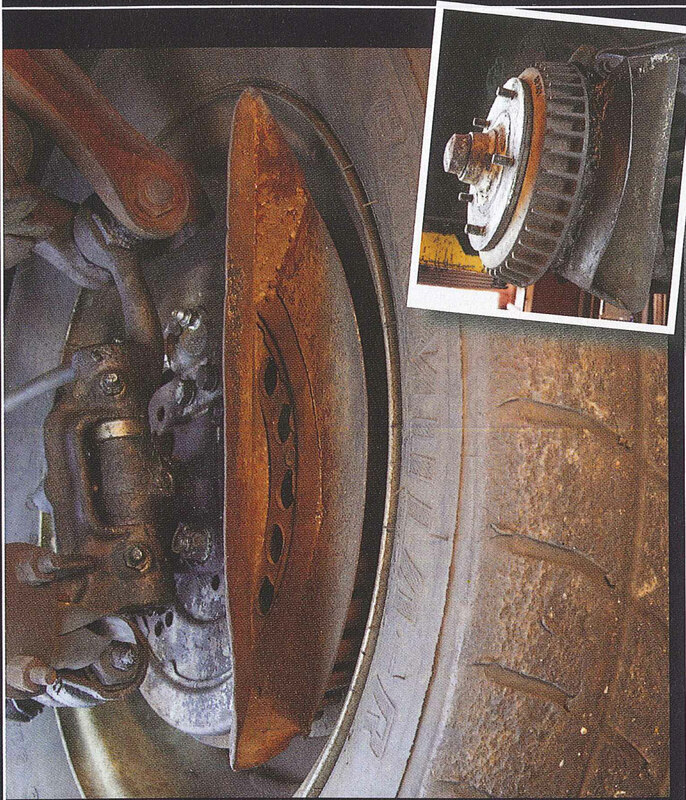 Back in 1960, when four-wheel drum brakes were the rule rather than the exception in touring car racing (unless you could afford a Jaguar or other exotic), providing effective heat management was always top of the job's list. Even so, West says these cars would run out of brakes after just a few hard laps! The front drums remained at the standard diameter as demanded by the rules, but special 'fan' castings with a series of lateral fins provided much greater heat dissipation than the standard items. 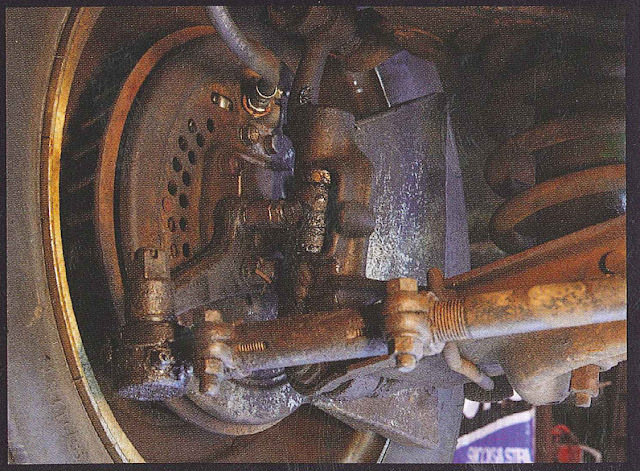 In standard form, each drum assembly featured brake shoes of unequal length. West replaced the shorter shoes with the longer shoes in each drum, to increase the total friction area available. 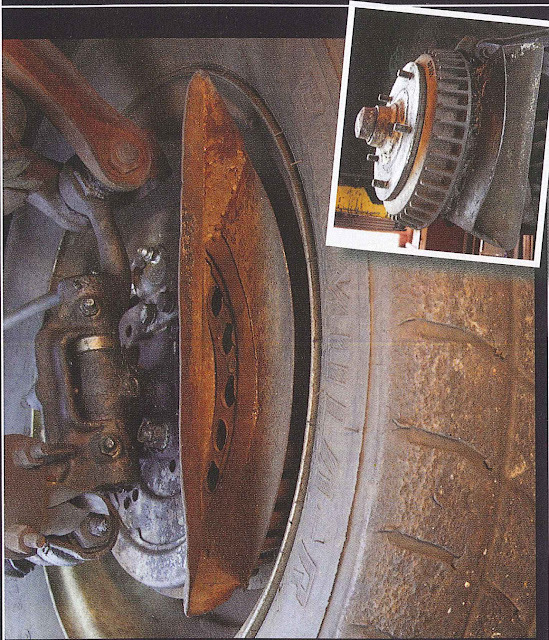 Shoe linings were made from an asbestos/sintered brass friction material designed to withstand high temperatures and Chevrolet hydraulic cylinders (with larger bores than the Holden items) increased fluid force on the brake shoes for greater stopping power. Additional cooling came from large air scoops hand-fabricated from thin metal sheet that attached to the front of the backing plates, which were heavily drilled at the front to allow cooling air to enter and at the back to allow hot air to escape. Just Sold and passed to a new owner log booked howlin humpy FJ Holden speedway car. Sold with no engine, but a grey engine suit reco came with it. 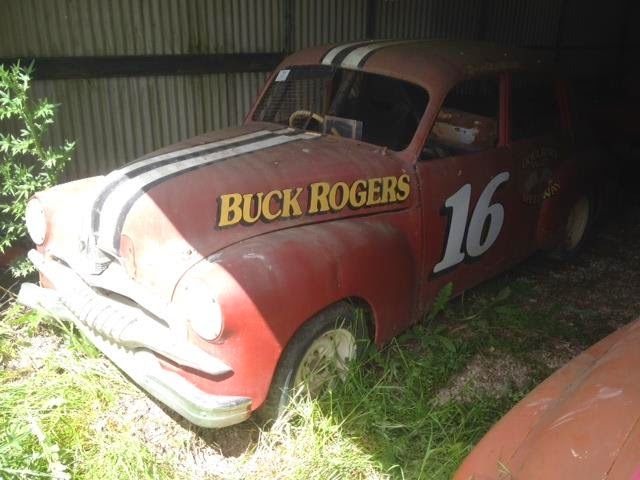 This car has done laps of Holden proving ground track at lang lang at 60th Holden celebrations with some other humpy speedway cars, the photos are in one of Don Loffler's books, was last raced by Dean Rogers in about 1999.